If you are an adventure freak, then this trek is for you. 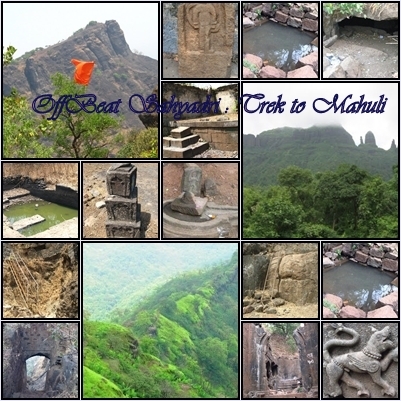 Mahuli though split in three parts viz Bhandargad, mahuli and Palasgad, they all are part of one huge fort. Mahuli is more known for the series of pinnacles vazir , vishnu …ect that attract the rock climbers from all over the Maharashtra. Its is the highest point in the Thane district. The kalyan Darwaja is the Konkan side entrance to the fort and its access has become difficult since the Britishers blew the stone carved steps. The specialty of this entrance is its location. It’s almost impossible to locate it as it has been carved in groves and cuts of the mountain through a huge rock. Since it was destroyed by Britishers, it requires technical expertise to access this portion of the fort. Beside an open Shiva Temple there is a smaill perennial drinking water cistern on top . three caves of which the larger can be used as overnight shelter. Note : please take return ticket till asangaon station. This train is usually very crowded its difficult to get into the train so we suggest people to take earlier slow train till kalyan and board this train from kalyan.